Emily McCreedy’s life is full and happier than she would have believed possible three years ago. With a two-week-old daughter, her rancher husband Clay, and her teenage stepsons, Justin and Cody, life on the domestic front is busy and rewarding. Her latest cookbook project is going well, and the Nugget, California community as well as the McCreedy family is gearing up for the Christmas holidays. Of course, Emily has not forgotten her daughter Hope who was abducted seven years ago from outside her San Francisco home, but three years of no new evidence has dimmed the flame of belief that someday Hope would be found. Then one December morning as she is preparing to take her infant daughter to town for a pediatrician’s appointment, she pulls a note from a plain envelope with no return address and reads these words: I HAVE HOPE. Is it a cruel prank? 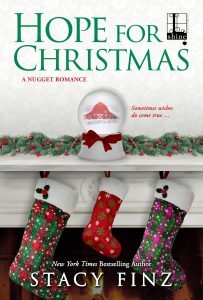 Will this Christmas make real Emily’s worst nightmare or answer her most fervent prayer? This review is a brief one because I am avoiding even a hint of spoilers. Hope for Christmas is the tenth story in Finz’s Nugget, California series. In this novella, Finz gives her readers an emotional tale that keeps them engaged not only with Emily but also with her husband and stepsons and to a lesser degree, with her former husband and his wife. All their lives will be affected by the answers to those questions. My limited description may suggest this is not a romance, but it is. Emily and Clay’s relationship is central to the story. But it is also the story of a family and of a community. The Nugget community is invested in the situation as well, and the warmth and charm of that community is consistent with its presentation in other stories in the series. Remarkably, Finz provides a positive conclusion without resorting to the simplistic. I gave Hope for Christmas a four-star rating based on the perspective of a reader who had not read all the earlier books. I had no problems following the story, and I found the characters sympathetic. Later, I downloaded Finding Hope (2014), the second book in the series and the one in which readers learn the story of Hope’s kidnapping, of its effects on Emily and Drew Matthews and their marriage, and of Emily and Clay McCreedy’s love story. I think Hope for Christmas is Finz’s gift to the reader of that book. The connection this reader feels to the follow-up story is powerful, and I suspect had I read the novel first, my heart would have insisted on a five-star rating for the novella. Duly noted. Read the Finding Hope book first for the full effect. Thank you for a no spoiler review. I have never understood the reviews that read like book reports and tell the whole story. That is one thing The Romance Dish is never guilty of. I can see how it would be hard to say much of substance about this novella without giving much away. Thanks also for the suggestion to read FINDING HOPE first. I always prefer to do books in order. It adds so much more to they enjoyment.